What are the function’s of management ? How does traditional management differ from scientific management ? (i) Forecasting- Forecasting is defined as the estimation of future activities i.e., the estimation of type, quantity and quality of future work. These estimates provide the basis to plan the future requirements for men, machines, materials, time, money etc. Forecasting may be done in connection with sales, production or any other type of business activities. Forecasting begins with the sales forecast and is followed by production forecast and forecast for probable costs, finance, purchases, profit or loss etc. (a) Recognition of the need for planning. (c) Building the premises for planning. Forecast is based on the. inferences drawn from the known facts and figures. The forecasts are used for formulating plans for future. (d) Identifying alternative courses of action. (f) Selecting a best course of action. performed and objectives are attained. 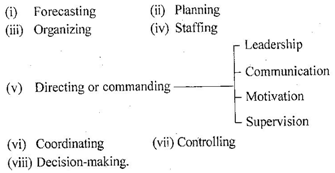 (iv) Staffing – Staffing involves manning the various positions created by the organizing process. It includes preparing inventory of personnel available and identifying the gap between manpower required and available, identifying the sources from where people will be selected, selecting people, training and developing them, fixing financial compensation, appraising them periodically, etc. Describe the factors causing centralization of authority in any industrial organization. “Managerial economics bridges the gap between economic theory and business practice”. Explain with examples. Discuss main objectives of a project management. What are its limitations ? Write short note on characteristics of management. Or Write in brief about the characteristics of management. Explain the properties of Cobb-Douglas production function. Write a short note on ‘project management’. What do you understand by managerial economics ? Discuss the salient steps for accurate managerial economics. Write short notes on incremental cost and sunk cost.